The Kilbride Car park and associated trails will be closed from 10th -28th September for some essential work to the overhead powerlines. Apologies for any inconvenience. Similarly, and although not an official recreation route, the Innellan Forest road from wyndham road will also be closed for the same duration. During this time, why not take the opportunity to explore a different part of the forest, such as the Ardyne trails, very similar in nature to the Kilbride trails but with a different outlook, or venture further north to Kilmun Arboretum or Puck's Glen. Hope to still see you around (a different part of ) the forest! The work to the overhead powerlines at Kilbride and Innellan has been postponed and at present we don't have a new start date, so please continue to enjoy the forest as usual and watch this space for further updates. Also, those of you using Kilbride Car Park may have noticed some graphs and posters appearing recently. These are the work of pupils from Kirn Primary School who have been carrying out surveys of the levels of and distribution of Dog Poo in the area as part of their John Muir Award. Their results make for interesting and slightly disappointing reading. We would ask all dog owners to clear up after their dogs, with the best option being bagging it up and taking it with you to an appropriate bin rather than leaving it lying about for someone else to encounter. See you around the forest soon. Just a quick note to say that the harvesting works on the Balgaidh Burn section of the Kilbride trails is now complete, so the trails are now open and ready to be enjoyed once again -and the view looks a lot different now! One last thing, FCS has joined the social networking scene with our very own Facebook page, so if you want to see what's happening around other forests as well as your own, have a look at http://www.facebook.com/enjoyscotlandsforests . See you around the real and online forests! For those who enjoy the forests, a rare opportunity has arisen to perhaps make it your job to share that enthusiasm. The Woodland Trust Scotland are currently recruiting for a Woodland Learning and Communities Officer, to be based in Dumbarton / Kilpatrick Hills area. A key part of this role is training teachers to use the outdoors in the Curriculum. Anyone interested needs to get in there quick as the closing date for applications is Thursday of this week. and possibly see you in a professional capacity around the forest soon. Good luck! ﻿﻿The Tree Council have decreed that May is to be "Walk in the Woods Month", and a very good month for walking in the woods it should be. 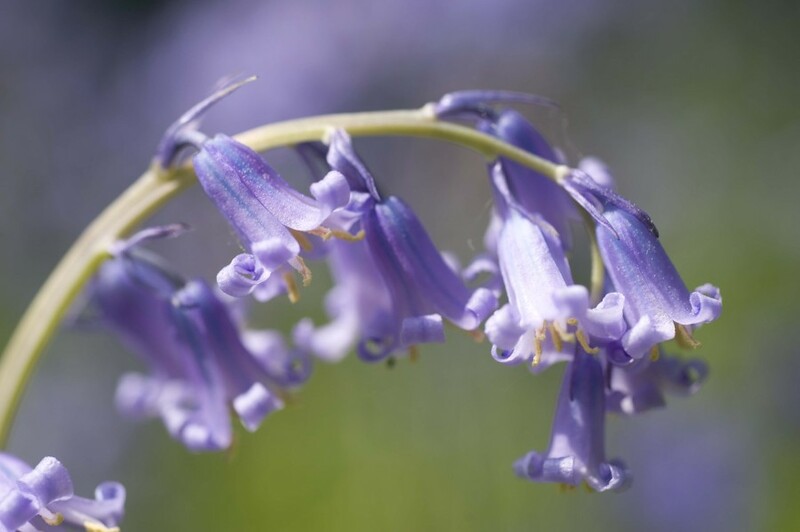 With the recent burst of Summer like sunshine, the forest is quickly coming alive with Bluebells abounding, froglets now instead of Tadpoles, Swallows and Cuckoos both reported in the local press. So if you've not been out for a while - now's the time to get back out there and enjoy the fantastic forests on your doorstep. - and see what's changed. (you might be surprised). With plenty still to keep the team busy - more than likely I'll see you around the forest. Well, that's winter finished with - allegedly. Must be true the daffodils, crocus, snowdrops and frogspawn are all out in abundance. Won't be long until the first Cuckoo is heard in the forest. The team have been very busy over the past couple of months, clearing windblown trees and reparing storm damage across the Argyll Forest Park. The Canada Hill single track section of the Corlarach Loop has been redirected (follow the waymarkers) and is now open and waiting for its first walkers, cyclists or riders of the season. The Harvesting continues above Kilbride so please continue to observe onsite directions and safety notices. There is scheduled to be some thinning and harvesting taking place around the Kilbride entrance to the forest and around The Tom above Innellan in the near future, no set dates as yet but I'll keep you updated. Hope you're all set to get out and about and I'll see you around the forest. Happy new year to all! Hope you all had a great Christmas and New Year and didn't get blown away by the recent winds. Speaking of which, if you are venturing out into the forest please do exercise extra caution as there is likely to be extensive storm damage in the form of fallen trees and possible damage to trails and roads. We have a lot of facilities to check and have not had time to inspect all of them and make them safe yet, so if you do come across something you think we should know about please do contact us on 01369 860703. Here's to a great 2012, when hopefully i'll see you around the forest.